Note: The polish I'm reviewing today is HTF (hard to find) polish. If you're lucky you can get it for a fair price or through swap. However, I have only seen it listed recently on ebay for $25. One the main themes of this blog is nail products for under $10. I decided to post it because it's something I was very excited about finding and wanted to share with you all. If anyone feels that I shouldn't be posting it because of its HTF status and it's price, I'll gladly remove this post. I love the feeling when you have fulfilled a major lemming, especially one you thought you'd never get. That's how I felt about OPI Pink Me I'm Good. I don't know why I put off buying it. It was a LE (limited edition) from Ulta during Valentines Day, that should of been major red flag to go out and get this polish while you can! Apparently that didn't compute, and when I was ready it was too late. I asked around, nothing. I saw it in a few giveaways I entered, but didn't win. Then I saw it on ebay for $25, no thank you. However, I was getting to the point of desperation it did cross my mind to pay that much for it. Luckily, another blogger had a spare she sold to me for a reasonable price! Thank you! Thank you! I'm sure they're tired of me saying thank you, but I am SO happy about this! 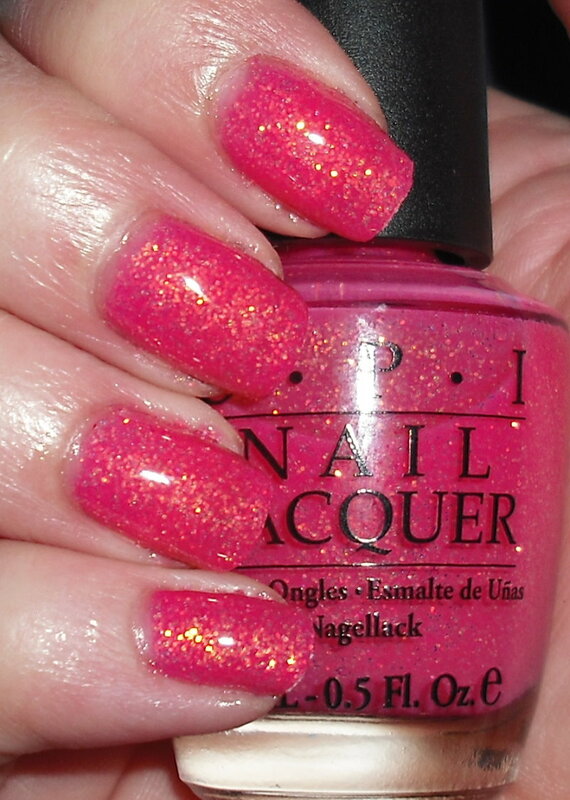 Pink Me I'm Good is a strawberry pink jelly jam packed with golden iridescent glitter. It's like sparkling sunset. I am in LOVE. I'm sure you all may notice why I love this so much. The gold iridescent glitter. Gold shimmer, gold glitter, gold flakies, and gold anything are right up my alley! I kind of wish more of the China Glaze specialty glitters featured a golden glitter rather than the white/silvery kind. Gorgeous, blingy color, that is my new love, and I'm so happy to own!!!! Any of your major lemmings been fulfilled recently? I'm happy that you were finally able to get your hands on it, I know how badly you wanted it. It looks pretty on you too! I'm just hoping that OPI re-releases it at some point in my lifetime, because I probably won't be getting it any other way. $25...haaa. P.S. I don't think you should take this post down at another's person's request, because this is your space, and you should be able to write what you want. If someone doesn't like it, then oh well. Haters are gonna hate. LMAO. I need a crash course in Polish Lingo and abbreviations lol... Anywho this is really pretty.I love the gold shimmer. I have "Strawberry Fields" by China Glaze and its kinda like this. Very similar to this actually. Chaos- I hope you can find it too. If you really want it my best suggestion is to look on Makeupalley for swaps. Good luck! Let them have- Sorry! I'm going to correct that now. HTF=hard to find LE= limited edition. It's great you mention Strawberry Fields that is my all time favorite China Glaze, so it's no wonder I love this so much. This is exactly like the glitter version of Strawberry Fields! YAY! I'm glad you were able to get this. It's so pretty!! Is it more sparkly than ChG Strawberry Fields? Why do this wonderful polish is HTF. I'm dying now. Wow! I've never seen this one before and it's gorgeous!! It's like China Glaze Strawberry Fields on steroids! This is honestly my all time favorite pink. I can't believe I gave away my backup bottle of it! Haha well, it was a fun giveaway anyway. I hardly ever rewear polish and I've worn this like 4 times because I'm so in love with it! So I can understand why you were lemming it so much, and it looks fantastic on you. I'm so glad you found someone who could help! Like I said to you on twitter, now it's on my wishlist! I never heard of this one but it is veryyy pretty and I am happy you fufilled your lemming! wwawhh so nice...! my blog is usually under 25 dollars too.. lol but that's bc i'm poor at the moment..and really i don't believe in buying that much for a polish..
but every once in while i think it's ok to splurge..! So, thanks for posting..! I see why you wanted this. It is SO YOU! Its a great color on you and I'd love to see a comparison of your 3 favs that are similar...this one, the Zoya (like I remember names, gah) and ChG Strawberry Fields that Megan commented about above. Megan- Yes, way way way more sparkly. I'll be doing a comparison tomorrow. April- GREAT description of this polish it is Strawberry Fields on steroids! Nicole- I can see why it is yours. It ties with Strawberry Fields to be mine. It's amazing. I'm so glad I found it! tasha- Thanks! I'm glad you got the Chanel polish you wanted for your bday! Leslie- Thanks! I know they should bring it back. It's a definite winner! Pretty- $25 is way more than I'd ever pay on polish. I think it was overpriced on ebay. I'm thankful someone sold it to me at a fair price. Mia, Twister, & Katrina- Thanks! Lacquer- Zoya Elke is my favorite red. I'm going to be comparing Strawberry Fields and OPI Pink Me I'm Good. Elke is a red, but is practically the same type of finish as Strawberry Fields just red rather than pink with gold shimmer. I can't get enough of gold.